1 handle. 4 cartridges. 4 flexible blades. 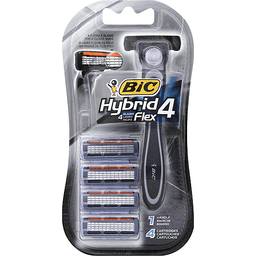 4 flexible blades individually adjust to the contours of the skin, providing a smoother and closer shave. Weighted handle for greater control. Lubricating strip and pivoting head for better glide. A new handle and cartridges in every package provides added convenience. www.bicworld.com. Bic Performance Policy US and Canada): If not fully satisfied, return to Bic for product replacement. Made in Greece.